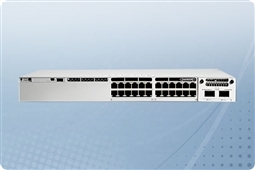 Cisco Catalyst 9300 Series Switches are the top enterprise platform for switching by the world’s top company for Networking, Cisco! 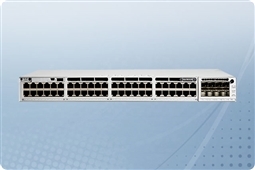 These powerful Cisco 9300 Series switches bring leading next generation technology to the small to medium size (SMB) business networks that rely on them through high density stacking capabilities with the highest stacking bandwidth in the industry along with powerful features such as 10 Gigabit Uplinks, high capacity memory, power over ethernet (PoE) and universal power over ethernet (UPoE) on select models, and Layer 3 access layer routing capabilities on most models. Additionally, other features such as intelligent power management and Cisco StackPower help to provide power stacking among groups for more power redundancy, keeping your network powered on! It is no surprise why IT Professionals around the globe rely on the Cisco Catalyst 9300 Series for their most robust networking requirements! Aventis Systems is proud to offer our Cisco Catalyst 9300 Series Switches all with a 1 Year Standard Comprehensive Warranty with upgrades available to Express Parts Next Business Day Replacement or Extended Term Warranties as well as Onsite Hardware Support Agreements. So please shop our Cisco Catalyst 9300 Series Switches below and get access layer, stacking, high bandwidth, and power over ethernet (PoE) features to help your business Get IT Done today!